UPDATE — Georgetown announced the hiring of Patrick Ewing as its new men’s basketball coach Monday. It took the news that a John Thompson is no longer coaching at Georgetown to make you realize that it’s been 18 years since the original John Thompson coached at Georgetown. So great was the power of the name, the continuation by suffix, that the presence of John Thompson III mitigated the departure of John Thompson Jr. in 1999 and made Georgetown still feel like Georgetown. Or Georgetown 1.5, at least. And now that’s over. At their peak, when Big John Thompson was running things, the Hoyas not only had a different look (the T-shirt-under-jersey that briefly became an official part of the uniform, the Nike Terminators, the kente cloth trim) but they had a different way of doing things. They insisted on playing teams at the main arenas in town, rather than the campus gyms. They stayed at remote hotel locations at the Final Four, far from the media madness. It was all part of building the mystique. The program also took on Big John’s primary trait: defiance. That’s far from the case today. The firing of Thompson III actually reinforces Big John’s legacy. Under his son, Georgetown basketball became … conventional. And when conventional programs with high aspirations and higher expectations wind up with losing records in back-to-back seasons, standard procedure is to fire the coach. By allowing Georgetown to become normal, JTIII became a victim of the norm. The Hoyas’ style wasn’t keeping pace with the changing nature of basketball, where high-powered offenses rule the day. The Hoyas ranked seventh in scoring in the Big East this season, following up on rankings of eighth, third, eighth, 13th and ninth in recent years. 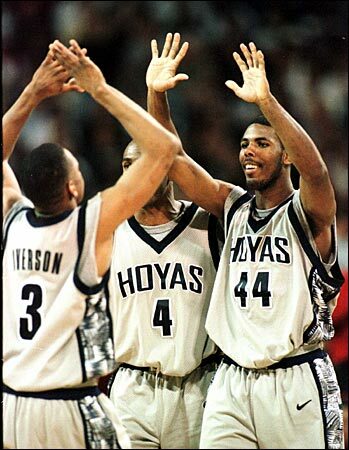 Back in the day, the Hoyas could get away with their offensive limitations because their defense was so ferocious. In 1981-82, for example, Georgetown was seventh in the conference in average points, yet still had a whopping plus-13 scoring margin thanks to a defense that held opponents to 53.6 points per game. The game isn’t played that way anymore. The Hoyas haven’t adapted. In a 3-point-happy world, the Hoyas were tied for 261st in Division I for 3-pointers made. Once one of the last holdouts of the four-year star, not yielding to early NBA departures until Allen Iverson left after his sophomore season in 1995-96, Georgetown missed out on the one-and-done level of talent that even Duke started pursuing. There is a way that Georgetown could make a progressive move and pay homage to the past. It could make Ewing the next head coach. It would be a nice bit of reciprocity for the man who had a greater impact on a university’s basketball program than anyone else in NCAA history. Before Ewing, the school’s NCAA tournament history was negligible; the Hoyas lost in the championship game in 1943, then won two NCAA tournament games (both in 1980) over the next 39 seasons. With Ewing, they went to the Final Four three times and won the national championship in 1984 – in the process making Thompson Jr. the first African-American coach to win the NCAA tournament. Ewing made the school a destination worthy of future Hall of Fame players who followed him, such as Mourning, Dikembe Mutombo and Iverson. Ewing has paid his dues for 15 years as an assistant in the NBA without getting the chance to be a head coach. Sometimes groupthink sets in, and for those not affixed with the label of “future head coach,” it’s hard to break through. Ewing’s alma mater could veer from the pack and do something different. They could keep it in the family while maintaining the tradition of being unconventional.